Easter is a popular time to visit Prague. 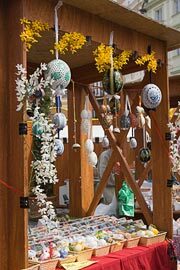 Spring is in the air, the Easter markets are going, and cheerful Easter decorations brighten up the city even when the weather is not quite warm and sunny yet. Prague is busy with tourists around Easter time, so plan your trip well in advance. If you spend Easter in Prague, you will probably miss out on the traditions that are still practiced in the smaller Czech towns and villages, but you will be able to enjoy the largest Easter markets in the Czech Republic. If you are thinking of coming to Prague for Easter, keep in mind that the weather at this time of year can be very unpredictable. It may still be quite wintry, or you may enjoy pleasant, sunny days. To get an idea of what to expect, please visit our Czech Spring Weather page. Then check the current weather forecast right before your trip.